Wow….Off To A Good Start……. – …………. ''AND LET THE FUN BEGIN''……………..
Wow….Off To A Good Start……. I am so amazed and pleased by the response and viewing of my Blog since yesterday….I had 87 people view it and 6 followers already. Now I know some of you know how to follow a blog but for those of you who don’t, on the side of the page is a place for you to put in your E-mail…Then you will get a notification every time I post a new blog….Also go to your E-mail and accept the first notification to complete the connection….Simple as that…. 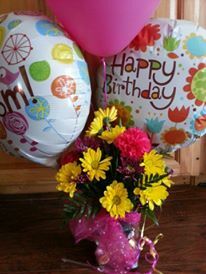 Her Card read….” Mom…Enjoy your last Birthday at Work….Love Tina, Ed Miley and Austin….. I do have another member of the family I haven’t mentioned yet….That would be my cat…..He came as a stray, to my front porch…..I had a dog at the time, Draven….He hated cats….Well, the cat didn’t leave the porch…Every day for 2 weeks I came home and he was still their, so finally we starting taking him in, and Draven and him became friends…..Well lets just say, they tolerated each other…. Well tonight I must finish cleaning out the hall towel closet….So much stuff….How often do you clean out all those little bottles of shampoo, conditioner, creams, band aids, shavers, Qtips, cotton balls, lost earrings, bobby pins, travel size soaps, that you just knew you would use..?…..OMG…..I accumulated a whole sack of just different types of band aids, gauze and first aid creams…..a whole box of different types of shavers….and then theirs the makeup….Half used bottles of stuff…………Grrrrrrrrrrr……Time for the garbage….Need to complete that task tonight….Another small step in cleaning out the house…. Also, you will also notice that their is a place to reply on the bottom…would be interested in any comments….lol…good or bad…..lol Just give me the truth…..I can take it…lol….also ……What are your thoughts on the theme I choose…..Do you like the black background with white letters? or would you rather read black letters on a white background…..Interested in what everyone likes……Until later…. ← This is the Beginning….Retirement is near…. Good job Wally. Enjoying the start of your blog. Looking forward to your blog Wally!!! Kitty will become a real trooper … sleeping on the back of the couch. We started traveling with a 6 year old cat and traveled with it for 8 yrs before it passed. I will say be careful about leaving windows open, On the first trip to Florida, I left the drivers window and screen open after parking the MH. The cat went out sometime that night. It took us 2 days to find it. I even slide the full length under the MH on my back in the mud with a flashlight looking for the cat because we though we could hear it meowing. We finally caught it after it became hungry. Dave , your hilarious between you rescuing the cat in the mud and you loading the car on the dolly in rain and mud….haha……Your such a good sport….